Sarah Sole is a visual artist, born and raised in New Orleans, LA. She received a BA in Mathematics and Fine Art from Rice University in Houston, TX and a PhD in Mathematics from the University of Houston. Upon leaving an academic career, she earned an MFA in Fine Arts from the School of Visual Arts in NYC. She is a recipient of a 2005 Fellowship from the New York Foundation for the Arts, a 2006 Full Fellowship from the Vermont Studio Center and a 2008 Alumni Scholarship Award from the School of Visual Arts. Her work has shown in art fairs and galleries in New Orleans, Miami and New York City, and is currently on view at Mark Borghi Fine Art, NYC and the Puffin Cultural Forum in Teaneck, NJ. She lives and works in New York City. This is her first exhibition with Devin Borden Gallery. The works in the exhibition are part of a series based on well known images of U.S. Presidents. 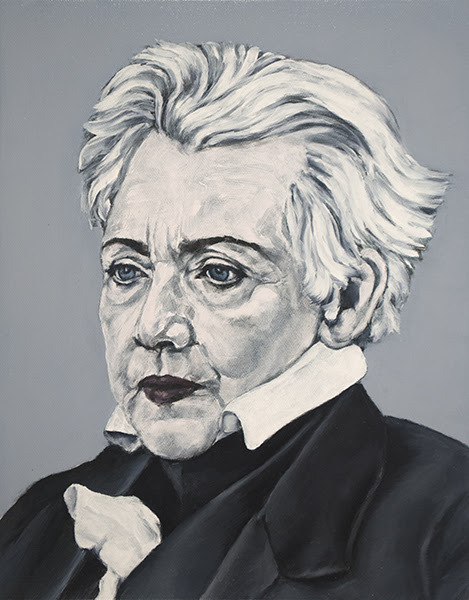 Simultaneously familiar and odd, original sitters’ clothing and hair are maintained with Clinton’s visage, subverting connections between power and masculinity in traditional portraiture. Please join us Friday for both openings plus openings at all Isabella Court galleries.Also opening works by Five Artists as part of Houston Sculpture Month: Clark Derbes, Sharon Engelstein, Paul Kittelson, Matt Messinger and Kaneem Smith.